He was the boss! I just had to do what I was told Where can you load mp3's on the web so I can link to it? joppo wrote: Where can you load mp3's on the web so I can link to it? is that from a tampon add? Right... here it is. This is his first draft. Forgive the poor recording and ignore the dodgy bass work Mike is playing both rhythm and lead guitar. He is now working on a chorus and some words. He's gonna be quite the muso, at 11 id have been proud o bangin pots in time to a song, let alone writing one Thats awesome dude. 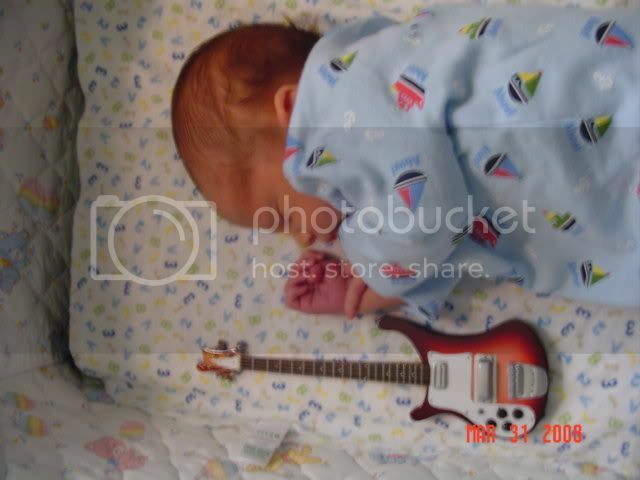 Randomplay wrote: He's gonna be quite the muso, at 11 id have been proud o bangin pots in time to a song, let alone writing one Thats awesome dude. Yep . That is really good for an 11 year old .Joppo must be proud, and Nev your bass sounds fat. Thanks guys. I showed him your posts and now he is strutting around like the only rooster in a hen house! He's pretty happy with it so far. Proud owner of Dee Murray's Steinberger! Whoa! That has got to be the biggest baby I have ever seen. This obvious are much bigger in Texas! Congrats Texas. Is that number one? joppo wrote: Whoa! That has got to be the biggest baby I have ever seen. This obvious are much bigger in Texas! Yep. He was 5 days old when that shot was taken, and I just turned 50! Well I thought I'd resurrect this old thread as my 9 year old started playing the drums about 8 months ago. He got offered to play drums on Monday morning school assemblies so we thought we'd better get him some lessons. Anyway I took him along to a mates place for a jam last night and I was super proud of him. All types of 8 beats, shuffles and a bit of reggae, and I didn't have to guide him at all. He just worked it all out in his own way. Still has a long way to go but he can feel and hold a groove, makes up his own beats and fills, and learns incredibly fast. I have three boys aged 12,16(soon to be 17) and 19,this one works with me too.....NO comment on that subject ! nuf said ! My 16yo has also taken up the drums and is very good at it,even been up and played a few tunes with our band on a couple of occasions,very proud moments for me too ! I back him 100%,even to the point of swapping my MIA Fender Jazz for a better drum kit for him and a Squier CV Jazz for me. He also plays guitar way,way better than me (but that doesn't take much).He also can play most things I show him on bass,very easily. How I wish I was like him at that age ! My oldest son is again pretty adept at picking things up on all 3,plays drums and guitar better than me as per usual,good on bass,but alas at this moment of life he has too many "other" interests....just like I did !